Not to be confused with The Financial Express (Bangladesh). The Financial Express is an Indian English-language business newspaper owned by The Indian Express Group. It is published by the Indian Express group since 1961. Financial Express specialises in India and international business and financial news. The Nikkei, formally known as The Nihon Keizai Shinbun, is Nikkei, Inc.'s flagship publication and the world's largest financial newspaper, with a daily circulation exceeding three million. The Nikkei 225, a stock market index for the Tokyo Stock Exchange, has been calculated by the newspaper since 1950. The Hindu is an Indian daily newspaper, headquartered in Chennai. It was started as a weekly in 1878 and became a daily in 1889. It is one of the Indian newspapers of record and the second most circulated English-language newspaper in India, after The Times of India with average qualifying sales of 1.21 million copies as of Jan–Jun 2017. 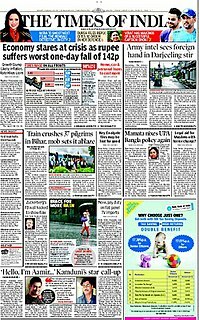 The Telegraph is an Indian English daily newspaper founded and continuously published in Kolkata since 7 July 1982. It is published by the ABP Group and the newspaper competes with The Times of India. According to the Audit Bureau of Circulations, it has a circulation of 466,001 copies as of Jul-Dec 2016. The newspaper is the fifth most-widely read English newspaper in India as per Indian Readership Survey (IRS) 2014. Virakesari is one of the leading Tamil daily newspapers in Sri Lanka. It is the oldest and the largest circulated Tamil Newspaper in Sri Lanka. Virakesari is owned by Express Newspapers (Ceylon) (Private) Limited, a leading print and web media organization in Sri Lanka. The San Antonio Express-News is a daily newspaper in San Antonio, Texas. It is owned by the Hearst Corporation and has offices in San Antonio and Austin. The Express-News is the fourth largest newspaper in the state of Texas, with a daily circulation of nearly 100,000 copies in 2016.. The Express-News operates online both as Express-News and as MySA. Dinamani is a Tamil daily newspaper. The newspaper was established in 1933 and is owned by The New Indian Express Group. The first edition was published on 11 September. It is printed and published from Bangalore, Chennai, Coimbatore, Dharmapuri, Madurai, New Delhi, Tirunelveli, Tiruchirappalli, Vellore and Villupuram. Il Sole 24 Ore is an Italian national daily business newspaper owned by Confindustria, the Italian employers' federation. Andhra Prabha is a Telugu language daily newspaper published in India. The website (www.prabhanews.com) is now owned by the New Indian Express Group of Companies but the news paper was sold to entrepreneurs from Kakinada. The Lakson Group is a Pakistani conglomerate company which is based in Karachi, Pakistan. It was founded in 1954 and is owned by Lakhani family. The conglomerate is based in Karachi, currently chaired by Iqbal Ali Lakhani and was founded in 1954. Mint is an Indian financial daily newspaper published by HT Media, a Delhi-based media group which is controlled by the KK Birla family and also publishes Hindustan Times. It mostly targets readers who are business executives and policy makers. It has been in circulation since 2007. Financial Chronicle (FC) is an Indian English-language daily newspaper published since 2008. The newspaper primarily covers Indian economic and international business topics, and financial news and issues. Aveek Sarkar is an Indian newspaper promoter and proprietor. He is the Vice Chairman and Editor Emeritus of ABP Group. Previously he was editor-in-chief of Anandabazar Patrika and The Telegraph. He was also the Chief Editor of ABP Group of publications. He was ranked as one of the most powerful Indians in 2009 by The Indian Express. He played vital roles during the formation of Penguin India, the Indian counterpart of Penguin Books and during the acquisition of STAR News in 2003.